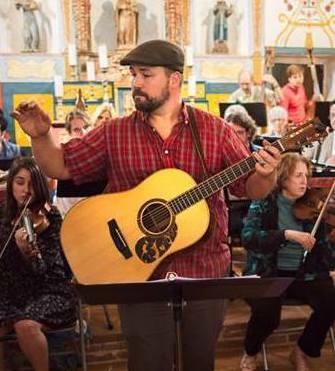 This past Sunday, September 16, 2018, some of our team at Art Without Limits had the opportunity to see our fiscally sponsored artist, Adam Phillips, and the Folk Orchestra of Santa Barbara perform a “rich amalgam of folk and classical music" at the El Presidio Chapel. The performance brought together some of Santa Barbara's best musicians to showcase the music of Sweden, Norway, Iceland, Finland, and Denmark through exciting, unique orchestrations that incorporated traditional instruments including the nyckelharpa (Norwegian keyed fiddle), hurdy gurdy, sackpipa (Swedish bagpipes), and seljefløyte (Norwegian overtone flute). Adam is showing achievements with the Folk Orchestra of Santa Barbara. Can't wait until the next performance!